Now this isn’t how every game and new member ends up, but there is a large amount of games made by new members that don’t ever take off, and for a variety of reasons. In this article I’ll be covering a wide variety of reasons why games don’t take off, and how you can both better prepare for your game’s arrival, and ensure that it’s launch is successful. These tips are for members new and old, as they can greatly improve the odds of your game’s success. So PLEASE give it a read! The Zone of Interest is a principal I use in journalism, it’s looking at where the interests of your target audience (or in this case, roleplaying community) lie, and then seeing how you can write your article in a way that makes it interesting to them. Now, How can you apply this to roleplaying? Think about it. There is a huge variety of people at Ongoing Worlds (or whatever site you might be roleplaying on), people with varying interests and opinions. It’s a good idea to check out what genres are popular on the website to see what the chances of your game (and it’s genre) taking off are. If there’s a few well populated and frequently posted in Star Trek games, that means there’s a large population of Trekkies at the site, and a Star Trek game might do well (see the next paragraph for the counterpoint). Also, because of the large Star Trek population Science Fiction will also be inherently popular. If there’s a few Harry Potter games but none have more than two-three members, and there’s little posts, it means that Harry Potter really isn’t what people on the site are interested in. It also means that maybe magic themed games might not be very popular. Once you’ve conducted your poll, it’s time to decide if you think your game would be popular. If the genre are your game is popular, there’s a fair chance your game might be received well. However, you shouldn’t let a lack of interest in your desired dissuade you from making your game. There could be other reasons why those Harry Potter games didn’t take off. Maybe their GM’s were overly controlling, or maybe the plots weren’t coherent. Make sure to do your research to make sure that this is the reason why those games didn’t take off, and not because nobody is interested in them. We’ll be covering the topics of coherency and organization later on. How Many are There Anyway? Now, this goes hand in hand with “Zone of Interest”, how many games of your selected topic/genre are there already? One of the biggest problems I’ve seen around Ongoing Worlds is multiple games of the same topic. Sure, there’s thousands of play by post games and fanfics on the internet, and if we worried about topics clashing then nobody would ever make another game again! It’s one thing for games and fanfics from across the internet to clash, it’s another for games from the same website. What I mean is, there’s a fine line between a healthy diversity of Star Wars games to choose from, and complete overload. It’s a good idea before making a game to survey how many of the same type are already present. One-two other games present at the time you’re making your game is an acceptable range. Anything over that and it’s reaching superfluity. I understand that you might really want to make this game, but the more games there are that are identical to yours, the lower your chances of attracting a large amount of members is (kind of an “oh great, there’s another one” effect). If you want to do a the game anyway, try to make it unique! Do a spin that hasn’t been done before. For example, instead of making a Star Trek game about a Federation starship, try making a game about a freighter crew, an independent vessel, or a colony. This will attract fans of that genre and give them an opportunity to experiment with new plot points and characters. This is quite possibly the biggest issue I’m going to cover: coherency. There are a lot of games that have poorly put together plots, or don’t make any sense at all. This is either because it was thrown together at the last minute, or not thought out thoroughly. When drafting a game, read the description, your notes, test posts to make sure that everything makes sense. Everything will make sense to you as you’re writing it because…well…you’re the one writing it. You won’t realize how great or messed up a plot will be until you actually read it. You might find that what you wrote earlier is very weak, and that maybe the plot could be better developed. Another problem might be that you didn’t really develop the plot, and threw it together as you were writing. This can lead to people skipping over your game and looking elsewhere. If this is the problem, it’s time to do some revising and editing. I spent several months drafting my game ORIGIN, and have several megabytes of scratch sheets and sketches floating around on my Drive account. I had every aspect of the game covered and was ready to go, so when the time came to actually make the game everything was already done. I recommend taking the time to write down all of your ideas on a document, and draft out your game’s backstory, characters, and intro posts ahead of time. This way you can revise the game in private, without any pressure from members, or the community. Once you’re sure the game is ready, put it all together and publish it! The plot is the most important part of the game. It’s what dictates the actions of the players, decides the course of the game, and ultimately makes or breaks the game. This is more of a long term goal, rather than a quick-start tip. The plot forms over the course of the game, but is ultimately spawned when you make the game. This and coherency go together like milk and Ovaltine, and if mixed correctly, have sweet results. When writing the plot, it’s important to remember that this won’t just be your story. It will be the story of every other player that joins, and every character they create. Make sure that you leave the plot open ended to some extent. Write the basic story and the important segments that will help guide the players in the right direction, but stop there. Leaving room open lets players come up with their own aspects of the storyline, like races, organizations, and so forth. This will also give you a rich extended universe, full of marvelous player created content. But another important thing to remember is to keep the story somewhat controlled. It’s good to give the players freedom, but if they’re given absolute freedom to do as they wish it might impede on the game’s plot and the storylines of the players. It’s helpful to have rules about posting, nothing heavy, but enough to make sure that you can keep the plot in check. If you’re making a game with a linear plot, ignore almost everything up there. These games can be finicky because the story is essentially decided, so it’s important to give the players some room to be creative. Leave room for sideplots and character development, and when the time comes to act out the main story, let the players put their twist on it. Also, let the players add some of their own content to the universe. Who knows, maybe that cool cat like race will be better as the villain than the frog people you had in mind. And if someone contacts you with critique and suggests changes, don’t be mad! They care enough about the game to contact you about it! Community is one of the pillars of roleplaying (community and communication will be covered in another article). One last thing, a huge problem I’ve noticed is that some games don’t allow for other players to post with characters that aren’t their own. That’s a HUGE mistake. Not only does that prevent any real character interaction it prevents any kind of deep storytelling, because characters don’t interact. Don’t allow that to happen! Characters are very important to a story, and it’s a great way to see the creativity of other players. This final segment won’t be about characters themselves, however, but a guide on how to set up for character creation in your game. As I’ve stated numerous times, LEAVE ROOM FOR CREATIVITY! Also, make sure there’s enough fields on the sign-up sheet so that the creator can put as much about their character as possible. This makes it easy for players to write for other characters, because everything they need to know is right there! Like everything else, set restrictions but don’t be too strict. Also, try not to make the fields too specific. Nothing like “favorite color” or “Best attribute”. Character creation will be covered in another article. By following these tips you can make one hell of a play by post game that will be sure to impress. Remember to keep the game active by posting constantly and holding events. Advertise on forums and look off-site for people looking for games. 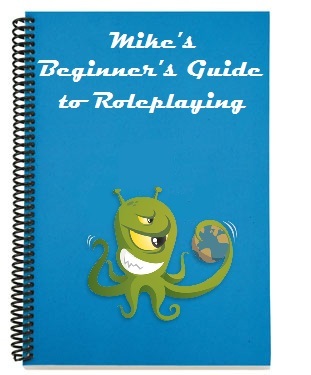 Keep your eyes peeled for the next installment of Mike’s Beginner’s Guide to Roleplaying! Have a good day and keep ongoing! I’ve created a new game – Now what?